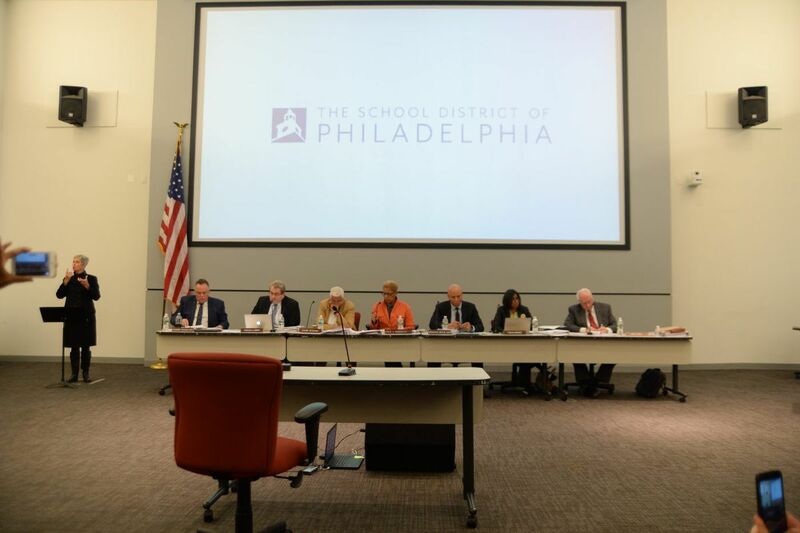 The School Reform Commission Thursday night approved a single new charter school for Philadelphia, another outpost for the successful MaST network in Northeast Philadelphia and adding 1,300 students to the city's charter rolls. But perhaps more significantly, it denied six others, citing significant flaws in applications, including those from well-known operators Mastery Charter Schools and Aspira of Pennsylvania. MaST III had applied to operate a K-12 school serving 2,600 students, opening this fall in the city's Somerton section. As a result of conditions imposed on the school, it will be limited to 1,300 students and will not open until 2019. "We're excited to have another charter, and serve more kids," John Swoyer, MaST's CEO, said after the meeting. "We'll work it out." There is enormous demand for MaST's two existing schools, Swoyer said: They received 15,000 applications for just 250 seats. The SRC did air some concerns about MaST, which "does not have a very diverse population," Chair Joyce Wilkerson said. Swoyer promised the school would better reflect the city's diversity: MaST III will reserve 50 percent of its seats for students from certain North Philadelphia zip codes, and projects that more than half of its students will come from families living below the poverty line. Would-be charters that had their proposals denied are: Antonia Pantoja Preparatory Charter School, APM Community Charter School, Eugenio Maria Preparatory Charter School, Franklin Towne Charter Middle School, Mastery Charter School Elementary, and Philadelphia Hebrew Public Charter. The six denials come amid a time of particular tension for the Philadelphia School District and its charter community. Seventeen charter schools have refused to sign their operating agreements, saying the school system is demanding conditions that would jeopardize their existence. And charter operators are complaining bitterly about a proposed charter amendment policy, which they say would be too burdensome. Nevertheless, charters are a very popular option in Philadelphia: About 130,000 students attend district schools while 67,000 are enrolled in the city's 84 charter schools. Jeffrey Stacey, a lawyer representing Franklin Towne, said the commission's 3-2 vote to deny the charter's application was "not surprising. This is the temperature." "It's a shame," Stacey said, "we have to be seen as competing with each other." Stacey said Franklin Towne would be "exploring all of our options" to open the proposed grade 6 through grade 8 school, "up to and including appeal" to the state Charter School Appeal Board. Schools may also fix problems in their application and resubmit them to the SRC. Franklin Towne was one of several votes that was not unanimous. Commissioners Bill Green and Farah Jimenez, who are generally seen as warmer to charters, voted to approve APM, Franklin Towne, Mastery Elementary and Philadelphia Hebrew. Both indicated they saw more merit to the quartet of applications than flaws. Green and Jimenez were outvoted by Wilkerson, Christopher McGinley and Estelle Richman. That Mastery — the city's largest charter operator with 14 schools, and an organization with a national profile — was denied surprised some. But the school district's evaluation report identified a number of problems with Mastery's proposal to open a K-8 school in the Yorktown section of North Philadelphia. Mastery, which proposed to open the school in 2019-20 and enroll up to 756 students, "failed to present any specific or compelling evidence that the Charter School would be able to meet its proposed enrollment targets," the evaluators said in the report. They called it "particularly concerning" that Mastery did not provide evidence of stated intent by families to send students to the new school. Mastery also said it would open in a building — the former Wakisha Charter School — that could not hold all of its students. Joe Ferguson, Mastery's Chief Operations Officer, said the organization was "extremely disappointed" by the commission's denial, "but determined." He said leaders would "regroup and decide" on next steps. He declared the SRC's concern about demand for a Mastery Elementary to be "nonsensical." Ferguson wouldn't comment on whether he expected the commission's denial. "I don't think we take anything for granted," he said. He declined to say whether he thought Mastery's refusal to sign agreements with the district for some of its charter schools in the city affected how the commission voted.